Carolly Erickson's biography of Alexandra Romanov, last Tsarina of Russia, is addictive; as addictive as the arsenic and opiates that Alexandra (Alix) took for her chronic pain and anxiety. As always, Erickson's prose is highly readable and descriptive and gives a balanced account of her subject. She is one of my favorite authors to read (another is Alison Weir, for the same reasons) because she focuses on the human aspects of her subjects, often letting them speak for themselves through letters and diary entries, and giving importance to their personal life and emotions, which lets the reader see them as a living, breathing, fallible human being rather than a two-dimensional biographical portrait. 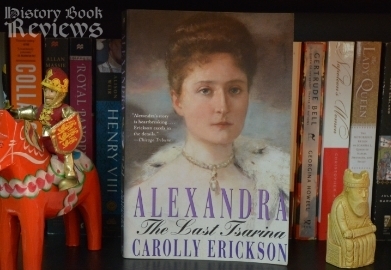 Erickson tells Alexandra's story chronologically, although her childhood and early years are fairly condensed; the book is mostly concerned with her life in Russia as Tsarina throughout the first two decades of the 1900's. Upon becoming acquainted with Alix, I found myself vacillating between pity and scorn for her, which is an indication of Erickson's unbiased reporting. It's amazing how naive and blind she could be, and although sometimes her spitefulness was justified she did some really stupid things (...really Alix? Drawing and showing off offensive caricatures of your mother-in-law and then being upset that she doesn't like you?). She could be unbelievably inconsiderate of other peoples' feelings, and it seems clear that she did not endear many people to her, even calling her most loyal friend "The Cow" when talking about her. She preferred isolation (perhaps this was wise) and a quiet family life to her imperial duties, which is understandable today but which was fatally despised by her contemporaries. Yet despite her flaws, Erickson portrays Alix as an unfailingly human person. She had good qualities too: She and her husband were deeply in love, she was a loving mother, she was deeply loyal to those she cared about and she always wanted to relieve the suffering of other people. All of these contradicting characteristics made her into who she was, and that is someone we can all recognize and identify with. Luckily for us, we will probably not be executed for our flaws like she was. 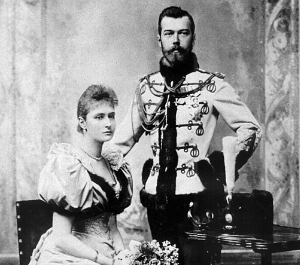 In all actuality, the Romanov family was murdered for a bigger reason than merely their personal flaws. Erickson does a wonderful job explaining, in brief, the background politics and economics that led to the overturning of the monarchy and the takeover by the communist Bolsheviks, even making the revolution seem like it was almost inevitable. Her explanation was so clear and concise that I, without a strong background in Russian history, could understand it immediately and place the Romanovs within the larger socio-political context of the early 20th century in Russia. It's not that she dumbs it down, but she very deftly summarizes the complex and confusing history and makes it easy to understand for newcomers to the field. One thing that was disappointing was the photographs/plates. There were very few, and all were pretty bad reproductions. They weren't even on glossy paper, just printed on the regular book pages! This book isn't old enough to use age as an excuse, and it would benefit a lot from a better selection of clear, quality photographs. This biography also goes into great detail of the relationship between Alix and Rasputin, which is interesting. It really gives a good understanding of why Alix needed him so much, what she saw in him, and equally what the rest of the country hated about him. Rasputin is still not well understood, and there is a lot of controversy among historians about his character and his intentions with the imperial family. Erickson does not argue on one side or the other, but explores the issue until it becomes clear why this relationship contributed in a large way to the revolution. Erickson's biography of Alexandra succeeds in what I believe is the most crucial aspect of a history book: The examination of the person as a whole without trying to prove that they were good or bad. My heart broke for Alix when she gave everything of herself into the war effort during WWI, working tirelessly as a nurse, and even the wounded soldiers she tried to help called her offensive names to her face, causing her to burst into tears. This book, fittingly, is solely about Alexandra; if you are interested in the other Romanovs and the tragedy of their deaths read Helen Rappaport's books, The Last Days of the Romanovs and The Romanov Sisters. I cannot recommend them highly enough! The end of Alexandra, the Last Tsarina leaves the reader with a heavy heart for the injustice done to the Romanovs, an all-consuming hatred of the Communist Party (or maybe that's just me...), and a relieved gratitude that Alix has been understood and respected in death as she never was in life.